While S. Res. 610 is not the call for the new 9/11 investigation that Architects and Engineers for 9/11 Truth (among others) have been seeking, this resolution highlights how the full story of 9/11 continues to be withheld – not only from the people of the United States, but to the family members and even the members of the United States Senate. 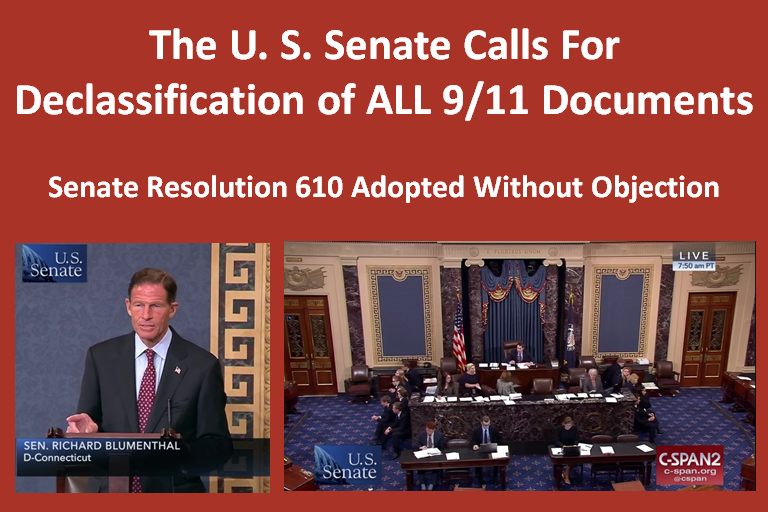 The enactment of this Senate Resolution illustrates what the 9/11 Truth Movement has been saying for years – that critical information is still being withheld from the people of the United States. We can use this official pronouncement by the Unites States Senate to ask others to join us in calling for the release of all the documents – and analysis – performed during the investigations.